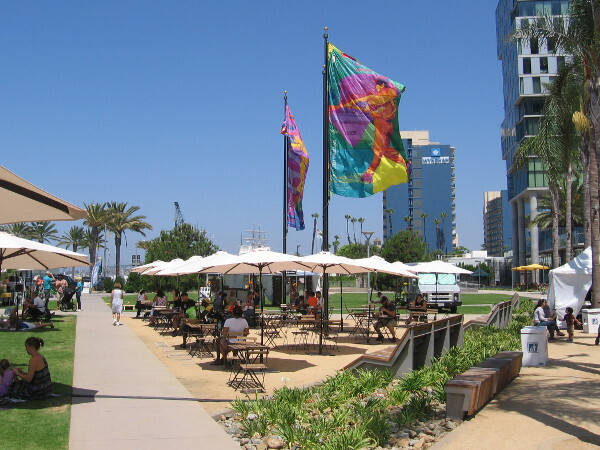 sunday – Cool San Diego Sights! 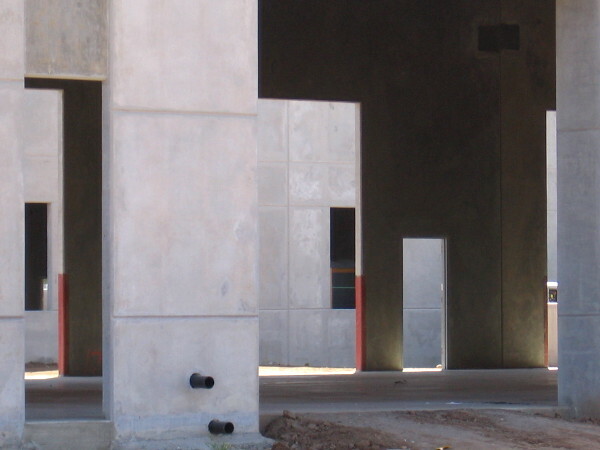 Cool sights along Adams Avenue west of 30th. 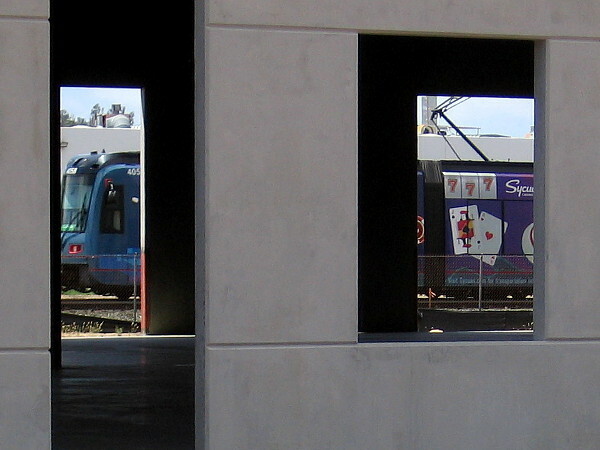 Surprising contrasts on a quiet walk. Sunday afternoon I took the trolley to East County to enjoy a quiet walk near Gillespie Field. 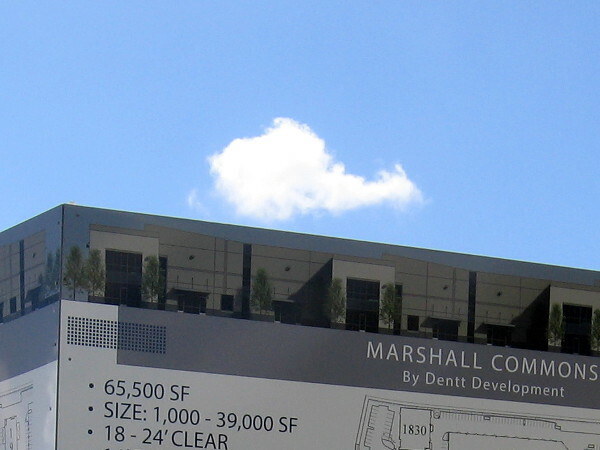 I knew that along Marshall Avenue there’d be no traffic. 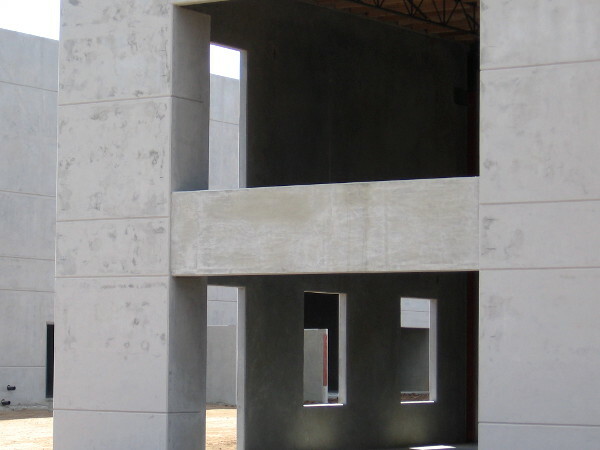 As I walked down the long, empty sidewalk I turned my eyes toward sleepy hangars across the street, burgeoning spring flowers at my feet and a large construction site abandoned for the day. All I heard was the whisper of the breeze, birds flitting here or there and small planes rising into the sky. The time and place was perfect for a stretch of thinking. I’m struggling with a short story that is particularly difficult. 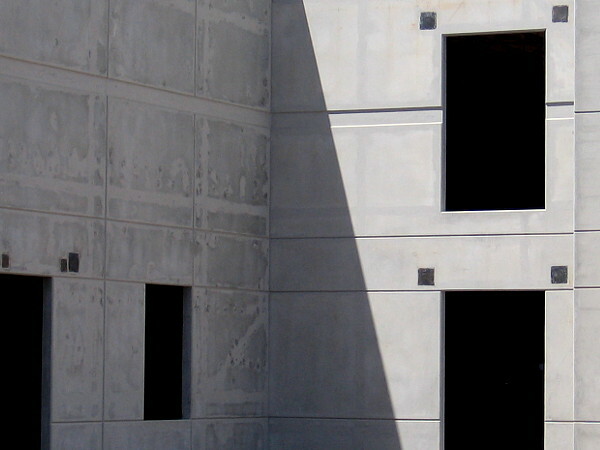 It’s a story about the complexity of people and the small actions that help to define a life. I keep changing the words. 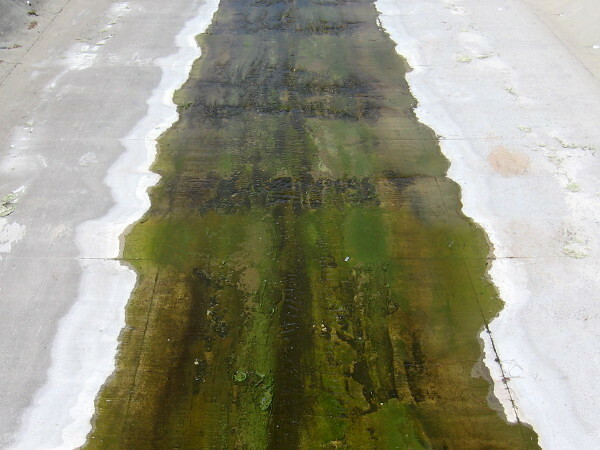 As I walked along in a state of abstraction I slowly became aware of surprising shapes and contrasts in the world all around me. Exactly like the complexity we find in ourselves. 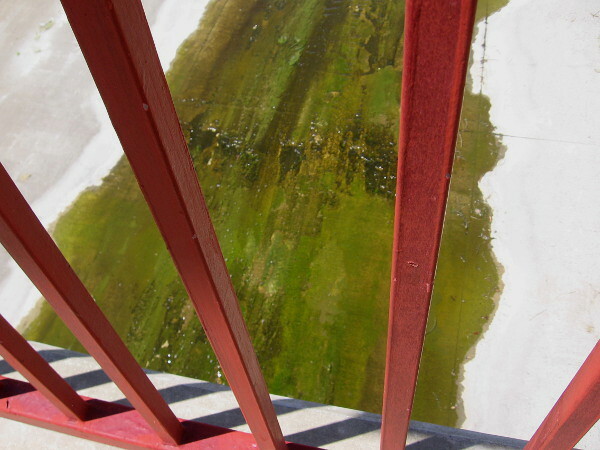 Posted on April 23, 2019 Tags city life, color, complexity, construction, dreams, el cajon, life, mysterious, photography, spring, strange, sunday, walking, writingLeave a comment on Surprising contrasts on a quiet walk. 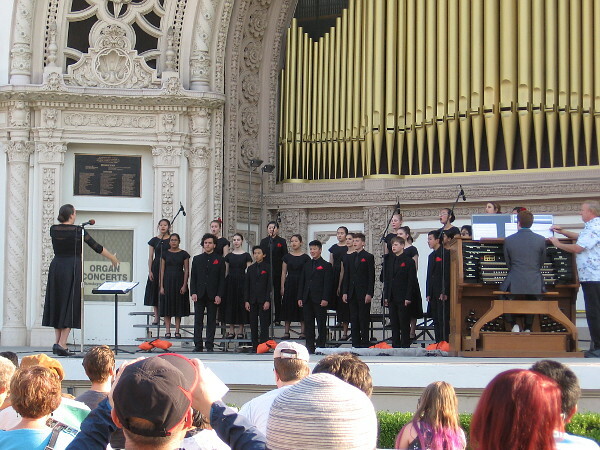 The triumphant return of the Spreckels Organ! 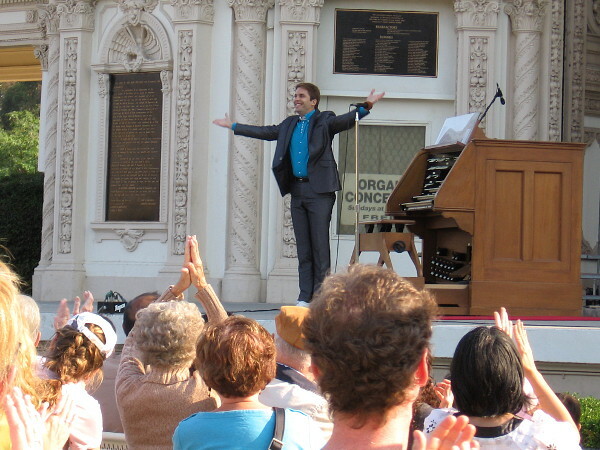 The amazing Spreckels Organ, largest outdoor musical instrument in the world and the joyful lungs of Balboa Park, made its triumphant return today! 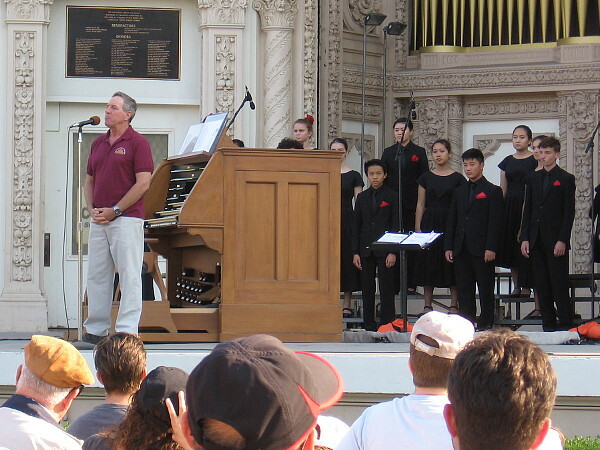 After six weeks of silence because of a broken motor on the main blower, the Spreckels Organ is once again producing fantastic music, with a little help from San Diego’s world-famous Civic Organist, Raúl Prieto Ramírez! Raul began today’s concert with Johann Sebastian Bach’s powerful Toccata and Fugue in D minor. 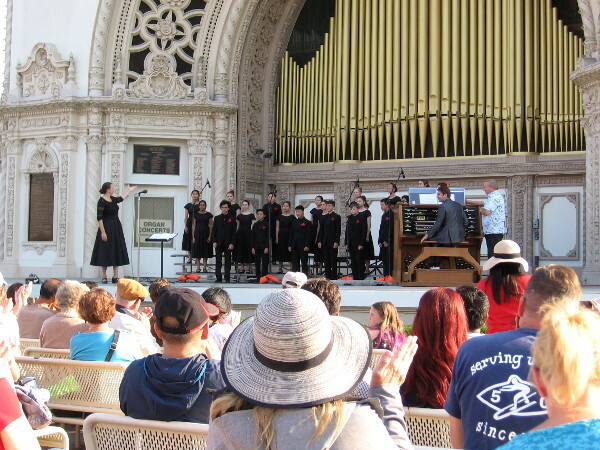 The talented San Diego Children’s Choir then took the stage to perform a variety of classical songs, including Franz Schubert’s moving Ave Maria. To honor Veterans Day, Raul concluded the program by playing three John Philip Sousa compositions: Semper Fidelis, In Memoriam, and Stars and Stripes Forever. In a troubled world where the flag often flies at half-staff, this Sunday we were reminded that human good can prevail. 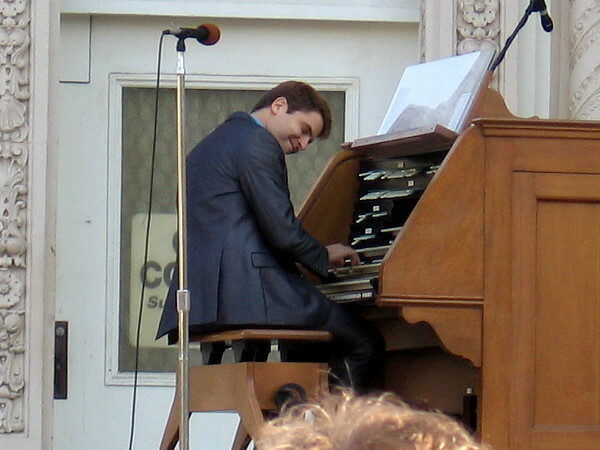 With a little dedication any broken instrument in this world–even the mighty Spreckels Organ–can be repaired. I saw many smiles in the sunshine. 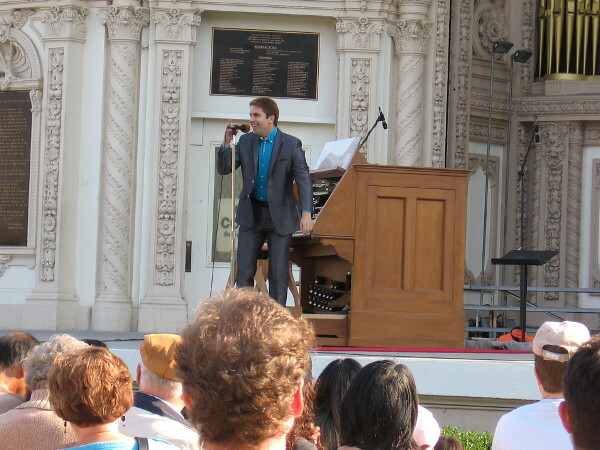 Posted on November 11, 2018 Tags balboa park, children, concerts, culture, music, musicians, optimism, organists, organs, san diego, singers, singing, spreckels organ, sundayLeave a comment on The triumphant return of the Spreckels Organ! 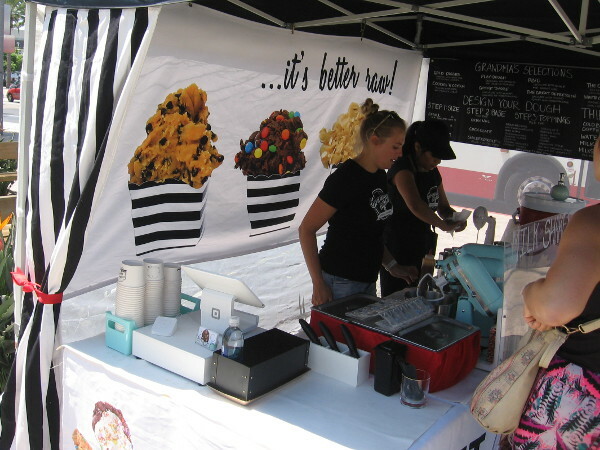 Lane Field Park Markets debuts in San Diego! The baseball windglyphs of local artist Lisa Schirmer fly above diners under umbrellas at Lane Field Park. 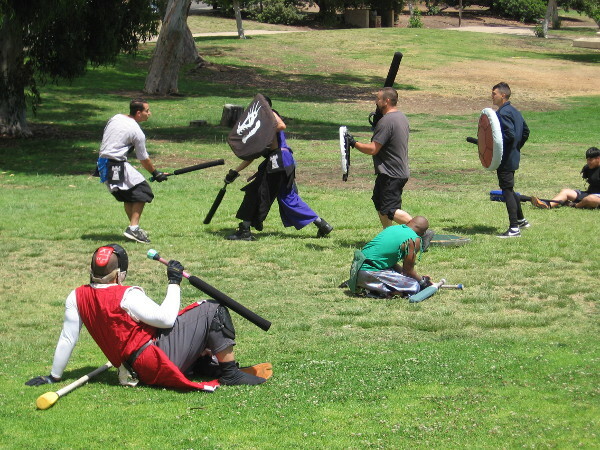 I was walking along the Embarcadero today when I saw a whole bunch of activity over at Lane Field Park. 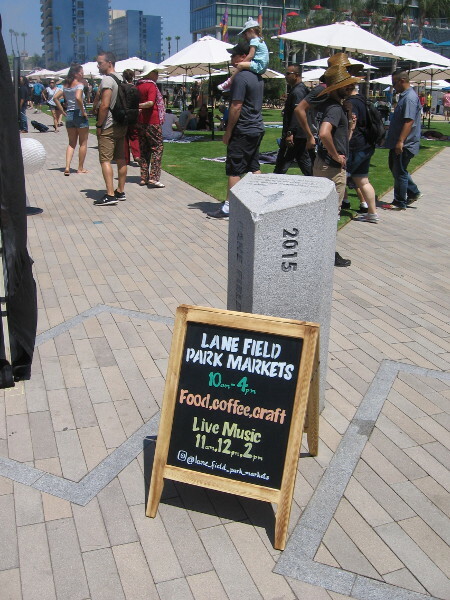 I soon discovered that today was the debut of a weekly “artisanal showcase of the creative food, drink, art and craft scene in San Diego”, otherwise known as Lane Field Park Markets. Every Sunday from 10 am to 4 pm, look for the tents and happy people inside Lane Field Park at the corner of Broadway and Harbor Drive! 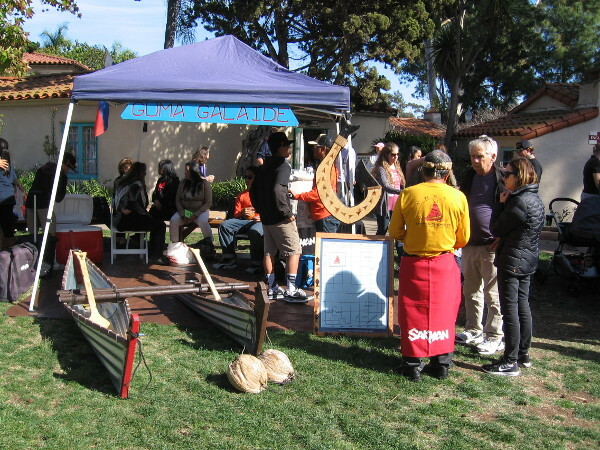 Lane Field Park Markets debuted in downtown San Diego near the waterfront today. 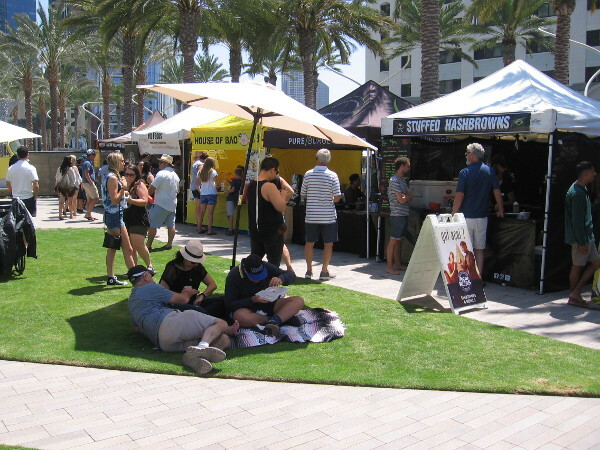 Lots of people were enjoying the sunny, grassy, outdoor farmers’ market-like setting. I saw tasty food to eat and lots of crafts and other good stuff. 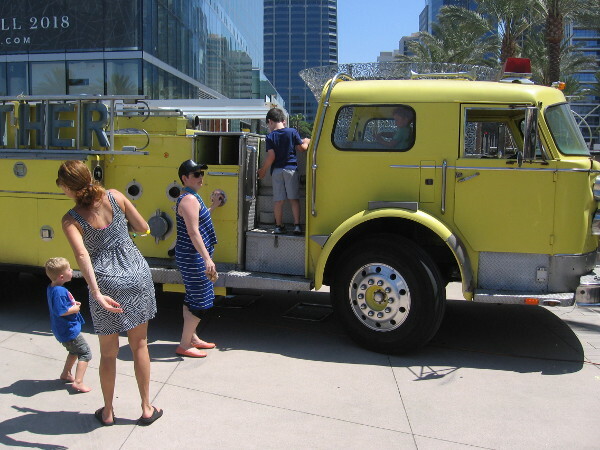 Kids liked checking out the Dang Brother Pizza fire engine. 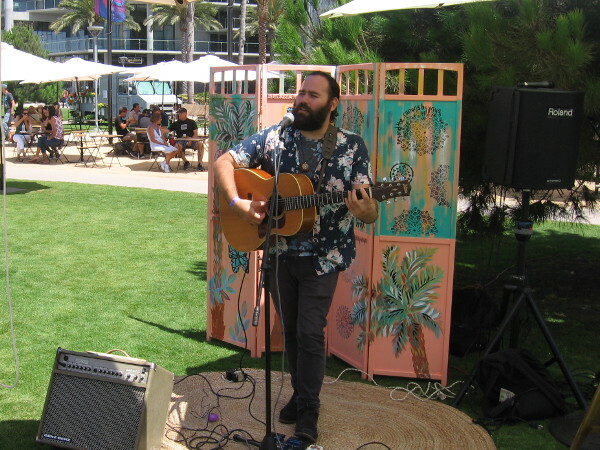 A guitarist provided live music, too! 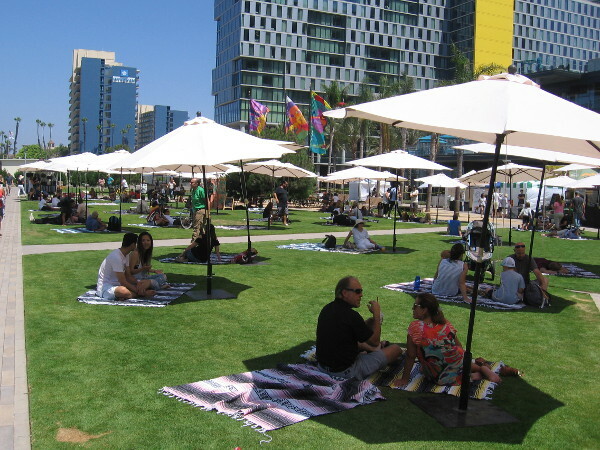 Posted on August 26, 2018 Tags downtown, eating, embarcadero, farmers markets, food, fun, music, parks, photography, san diego, shopping, sundayLeave a comment on Lane Field Park Markets debuts in San Diego! 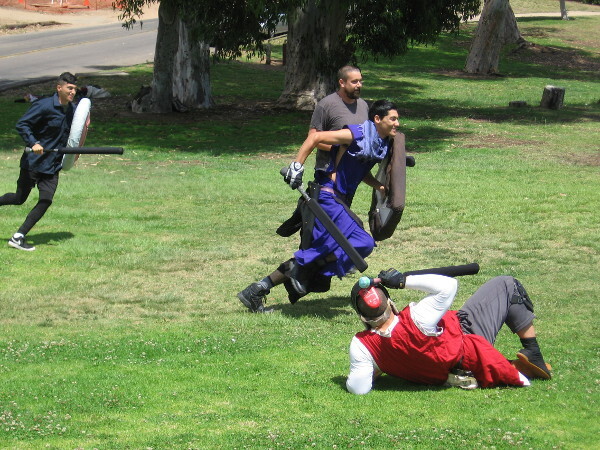 Medieval knights mock fight in Balboa Park! Look what I watched today! 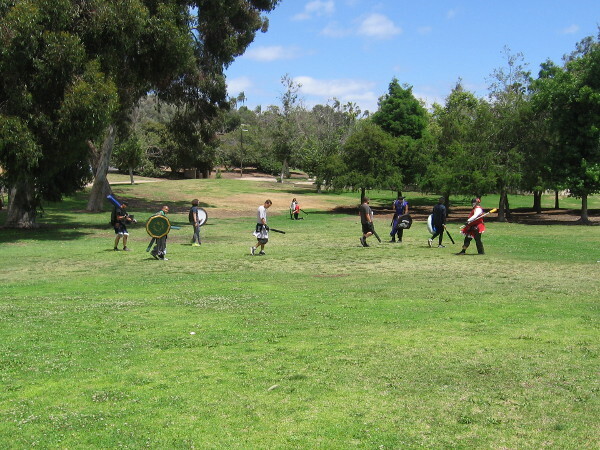 Every Sunday afternoon, on a large area of grass in Balboa Park’s Morley Field Sports Complex, medieval knights come together and engage in mock combat! These brave knights hail from the Realm of Andor. 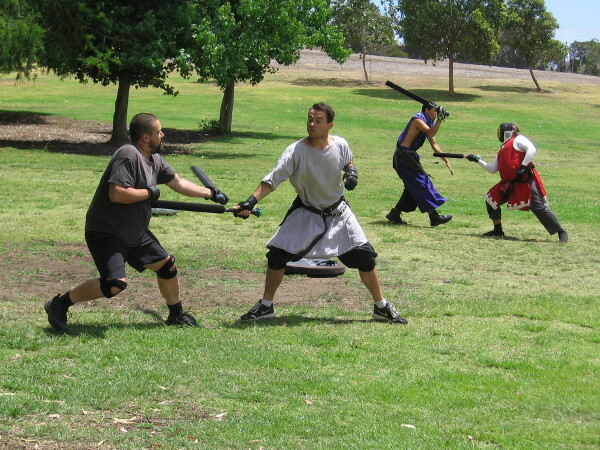 They are a part of the international Belegarth Medieval Combat Society. 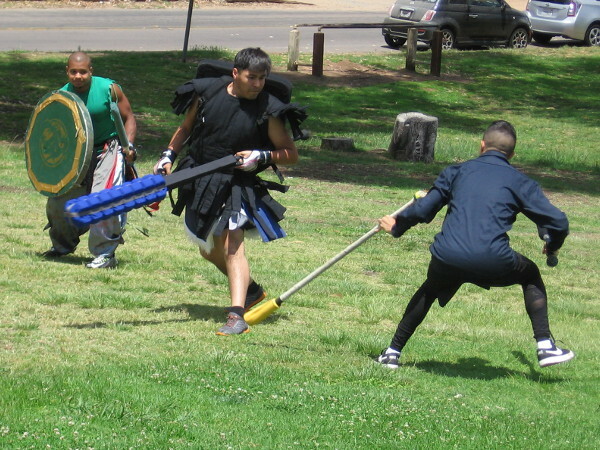 Wielding foam weapons like swords, maces and battle axes, these guys get a super fun athletic workout. 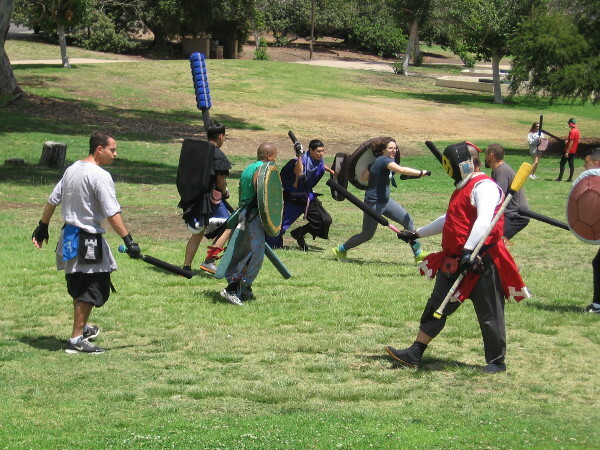 I was told by a friendly member of the Realm of Andor that the sport is like a mixture of fencing and rugby, with fairly simple rules. When a combatant receives a strike to a critical area, they fall down as if dead. 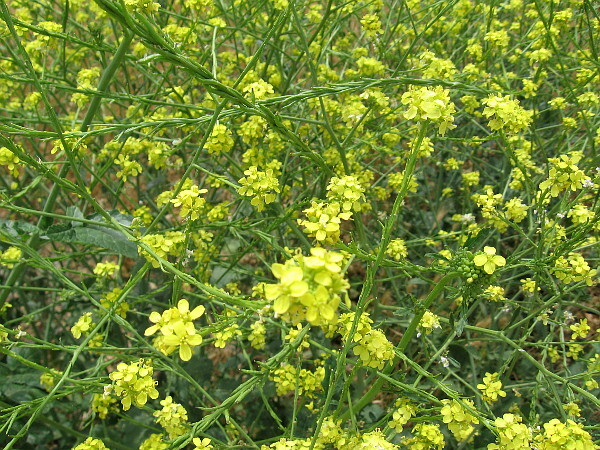 A hit on a limb results in a loss of its use. Two limbs gone, you’re a goner. The last one standing wins! I watched as the combatants veered all over the place, swinging a variety of formidable ancient weapons. Two or three knights would gang up on another; others would be struck by a sneaky knight from behind. 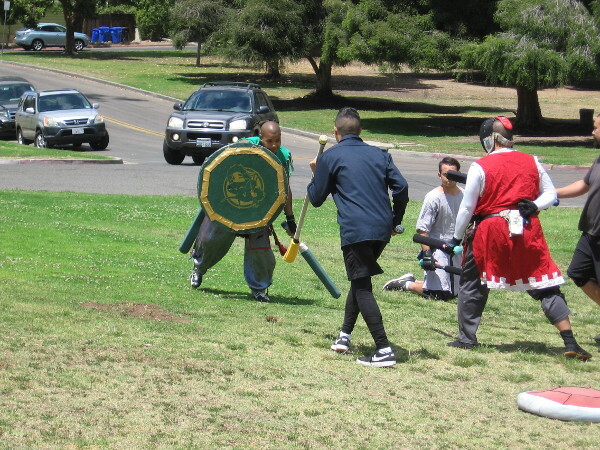 Some of the members, in their cool costumes and bearing shields, appeared to be rampaging extras in the filming of Lord of the Rings. Many make their own weapons. It’s all about fantasy and high energy fun! 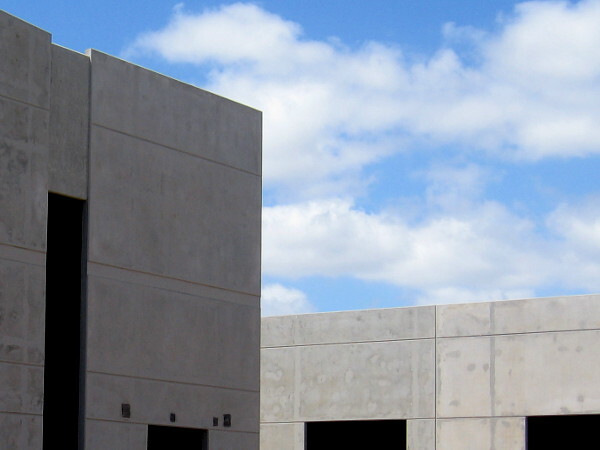 If you’d like to learn more, or perhaps join, check out their website! 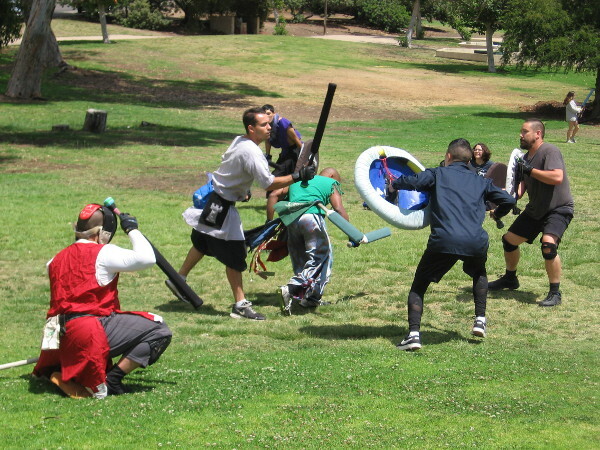 Posted on June 17, 2018 Tags athletes, balboa park, costumes, fantasy, fun, imagination, photography, recreation, san diego, sports, sunday, war2 Comments on Medieval knights mock fight in Balboa Park! 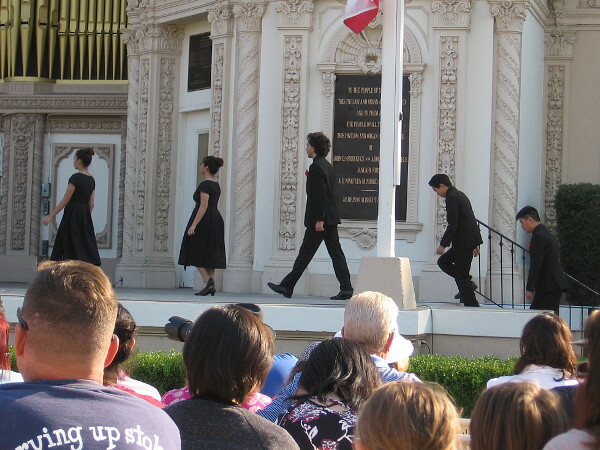 Dance on Sunday afternoons in Balboa Park! 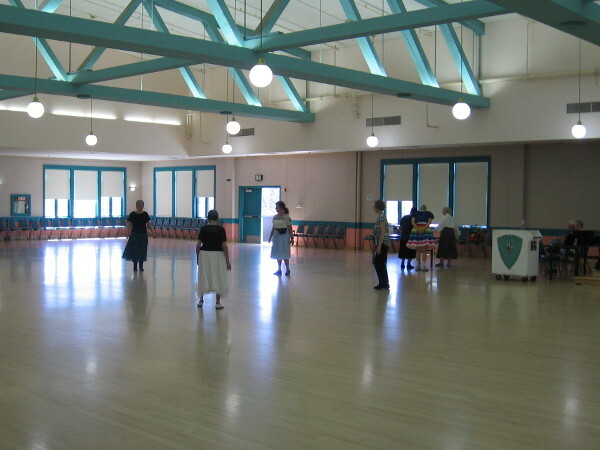 On Sunday afternoons I seem to be spending more and more time in the grand Ballroom of the Balboa Park Club. Cushioned chairs line the walls, and I can sit peacefully as I read or write, listening to gentle, sprightly folk music, occasionally looking up at happy people dancing. I don’t do much in the way of dancing–not with my feet. But I’m sure some of you do! And I bet some of you’d like to learn all sorts of different folk dances! I spoke to a nice lady who is a member of one of Balboa Park’s dance clubs, and she told me they are looking to grow their membership. 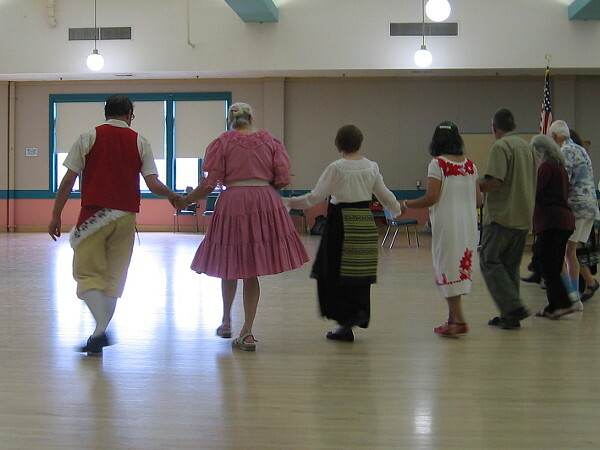 There’s an opportunity for ordinary people with varying levels of experience to learn folk dances from many different cultures. And each lesson costs only a couple bucks! 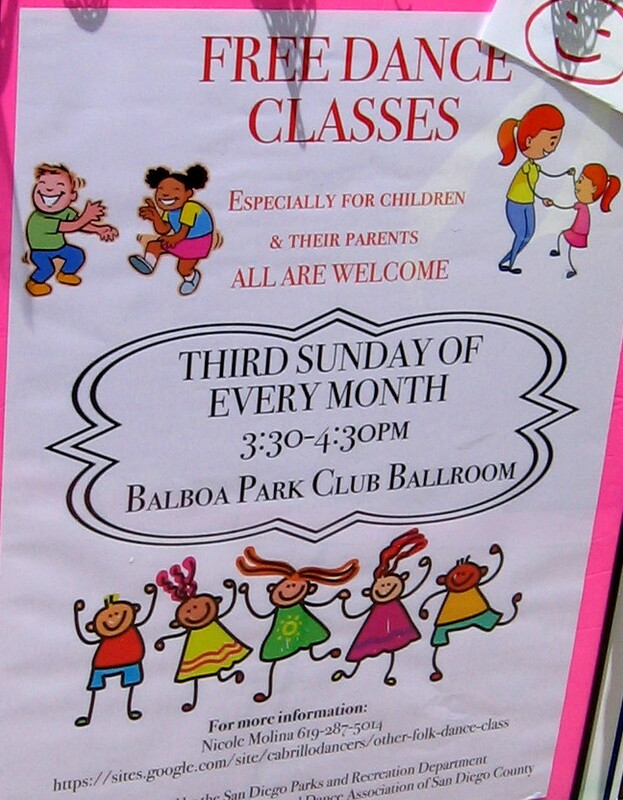 As you can see from one of my photos, kids and parents can also learn how to dance the third Sunday of every month, from 3:30 – 4:30 pm. Sounds like fun! Interested? 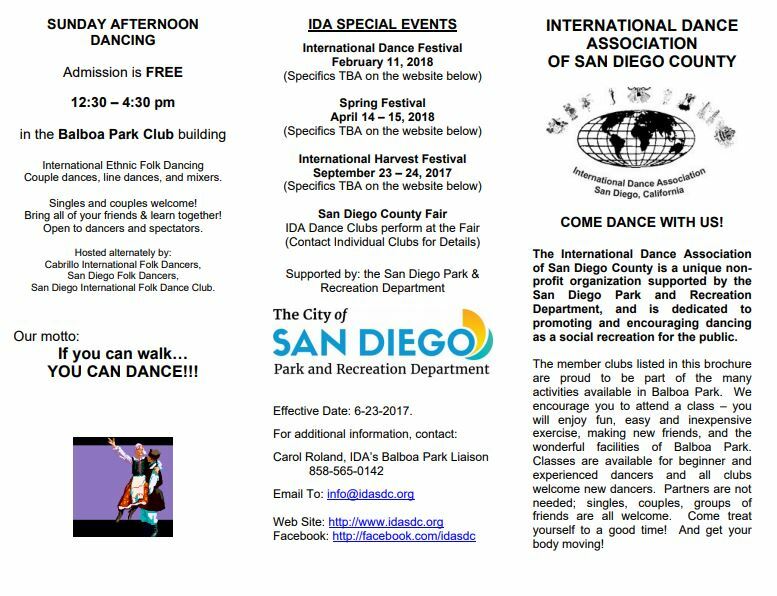 Visit the International Dance Association of San Diego County website by clicking here! If you can walk, you can dance! 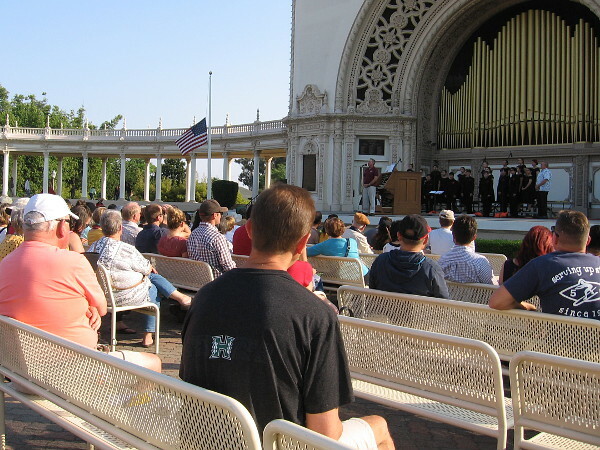 Posted on April 15, 2018 Tags balboa park, culture, dance, dancing, diversity, education, entertainment, family, fun, happy, kids, music, san diego, sunday2 Comments on Dance on Sunday afternoons in Balboa Park! Another glorious spring Sunday in Balboa Park! People walk through Balboa Park’s sunlit Alcazar Garden on a beautiful spring Sunday afternoon. 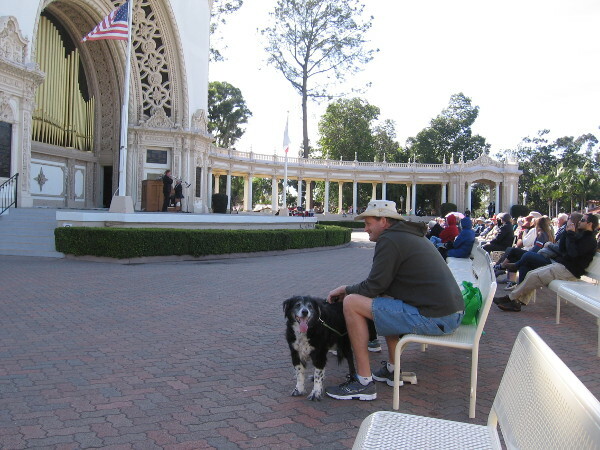 I blog about Balboa Park frequently. I hope you’re not getting tired of it. I’m not. I live downtown, very close to San Diego’s crown jewel, so I walk up to Balboa Park most Sundays. That’s what I did this afternoon. It truly felt like spring today. The sun was out, the air was warm, flowers were blooming, fountains were splashing, and Balboa Park sparkled in its full glory. 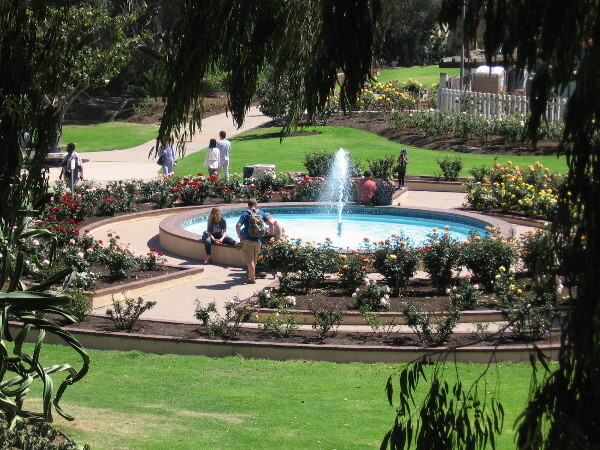 I took so many photos, I’ll be posting many of them on my other website, Beautiful Balboa Park. Those upcoming posts will concern the amazing art collection of the San Diego History Center, and loads of fun artwork that I spotted in Spanish Village. Look for those photos in the next couple days. 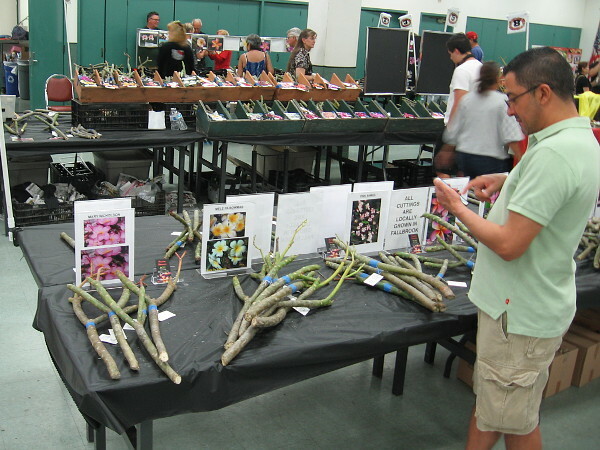 The Southern California Plumeria Society was having their annual cutting sale inside the Casa del Prado. I learned they’ll have many more cuttings at the May 26th Fiesta Botanica event in Balboa Park. Someone plays with a hula hoop in the Casa del Prado’s outer courtyard. 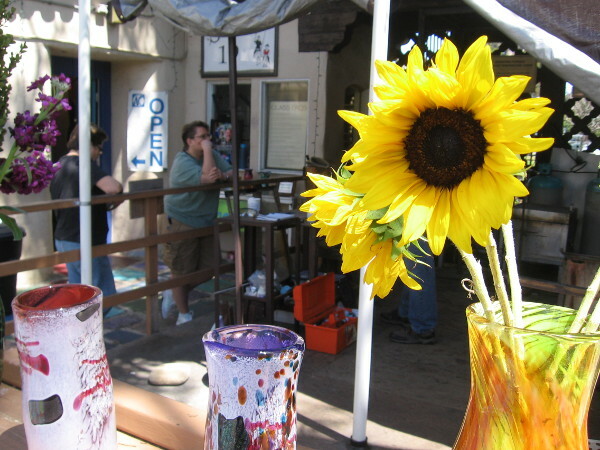 Bright yellow sunflowers in hand blown glass vases in Spanish Village Art Center. 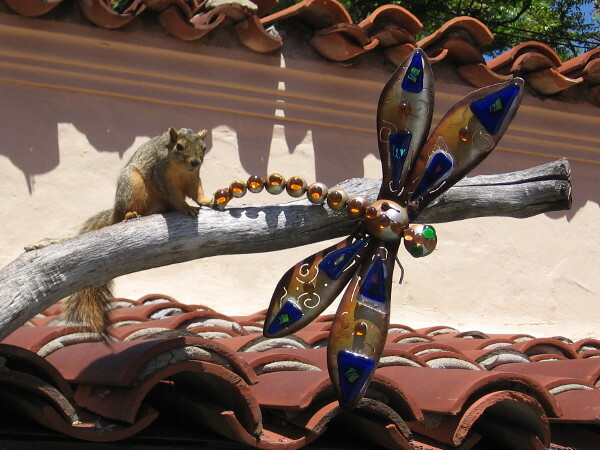 A park squirrel seemed fascinated by this shiny dragonfly sculpture at the edge of a rooftop in Spanish Village. Playing sprightly music for passersby near the House of Hospitality. 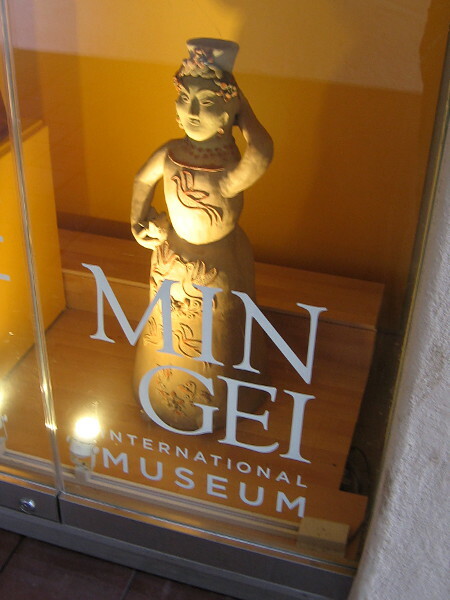 A clay female figure on display in one glass case outside the entrance to the Mingei International Museum. 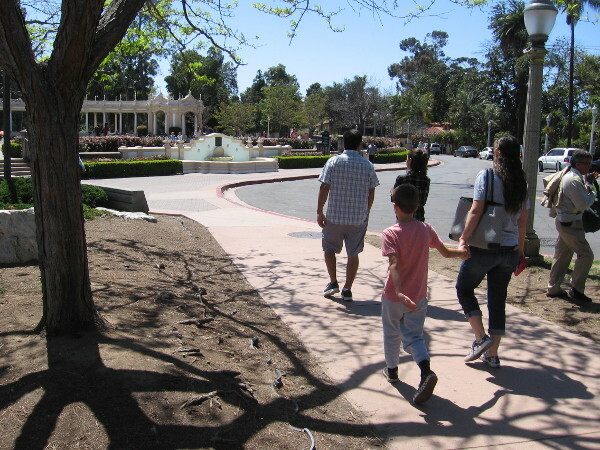 A family walks toward the Spreckels Organ Pavilion. 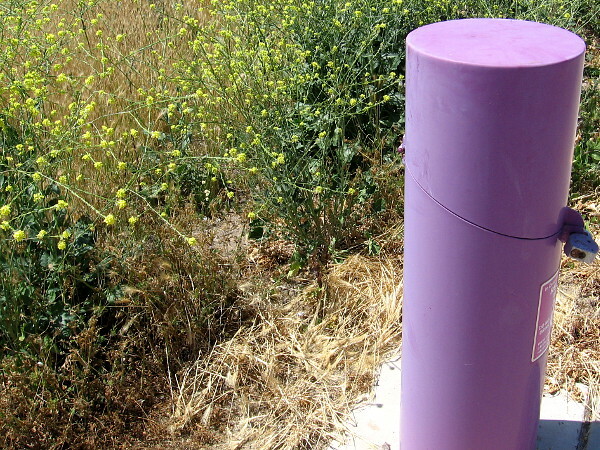 It’s a perfect spring day to be outside in San Diego. 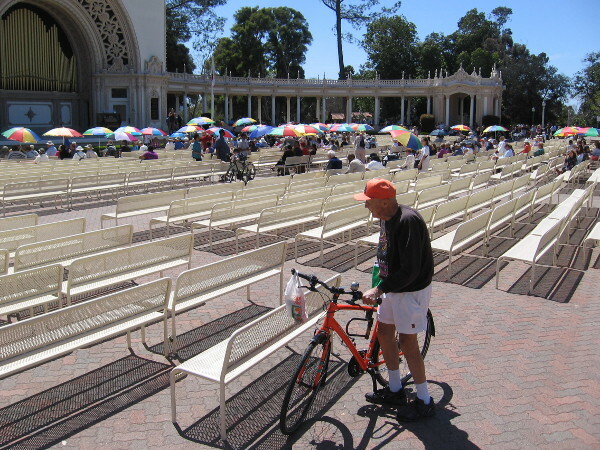 A bicyclist has arrived for the two o’clock Sunday organ concert in Balboa Park, which is always free. 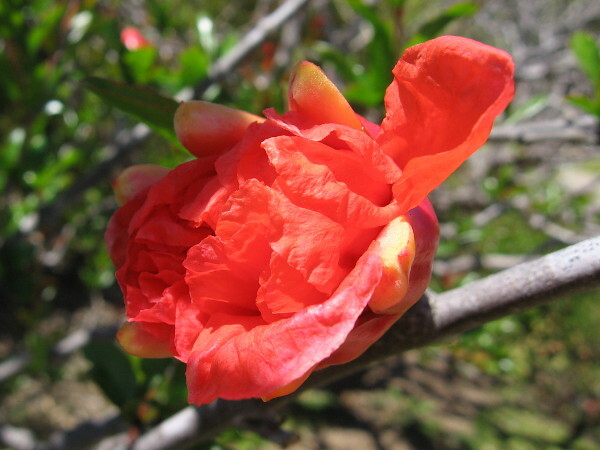 A gorgeous spring bloom in the Japanese Friendship Garden. 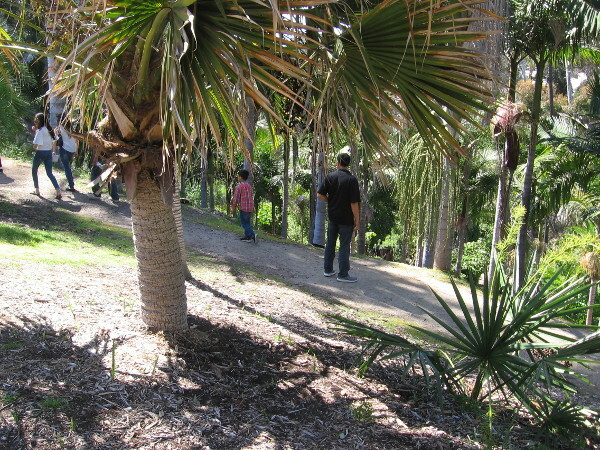 Some people emerge from a walk through green Palm Canyon. 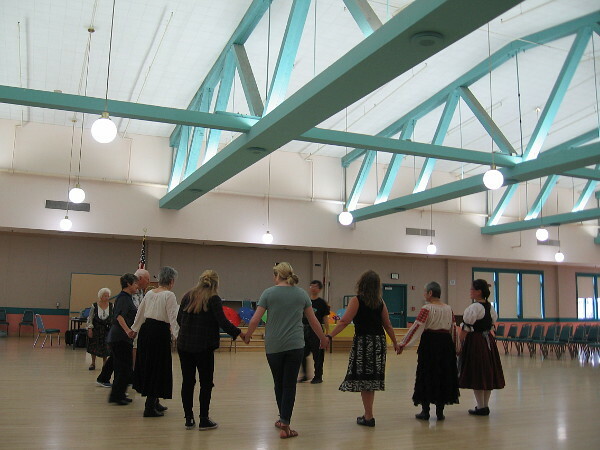 I watched a bit of folk dancing by the Cabrillo Dancers inside the Balboa Park Club. 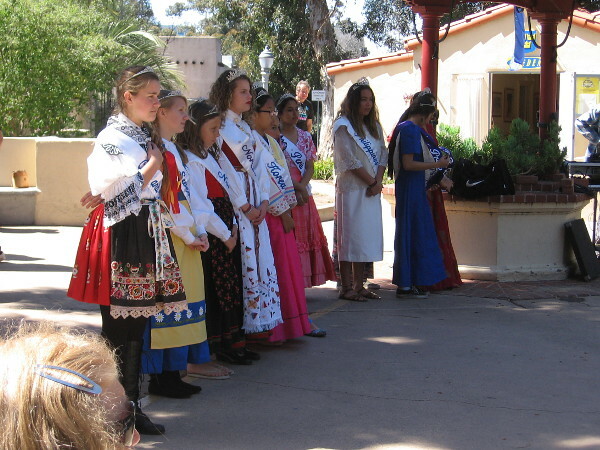 This year’s youthful House of Pacific Relations queens stand on stage during a program at the International Cottages. It seems there is now limited time to save the historic Starlight Bowl. 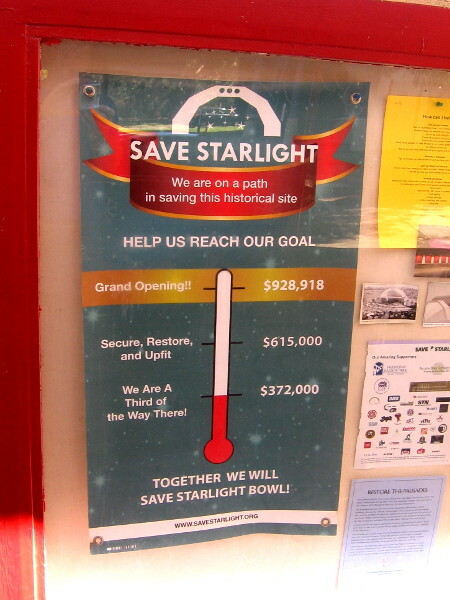 If you want to help, please take action and visit savestarlight.org today! 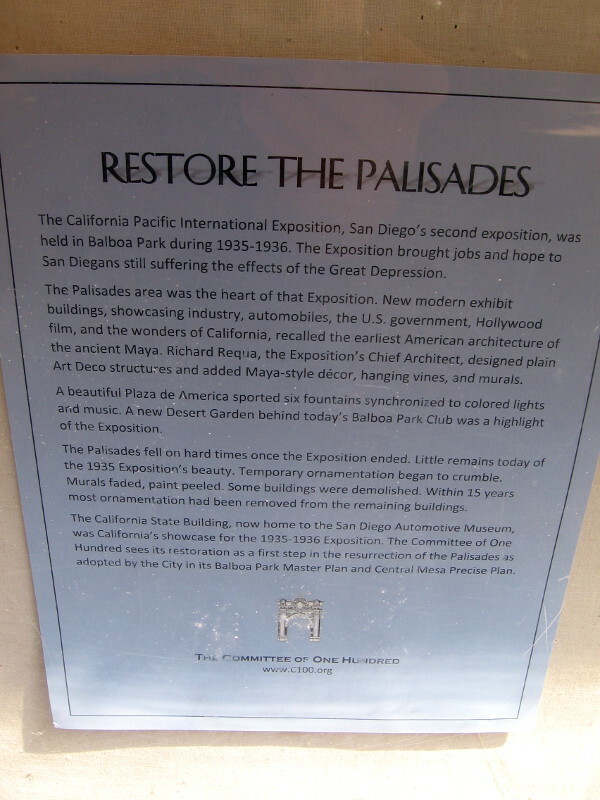 I’m a big supporter of restoring the Palisades section of Balboa Park. Learn more at the Committee of One Hundred’s c100.org website. Looking down at the fountain inside the Inez Grant Parker Memorial Rose Garden. 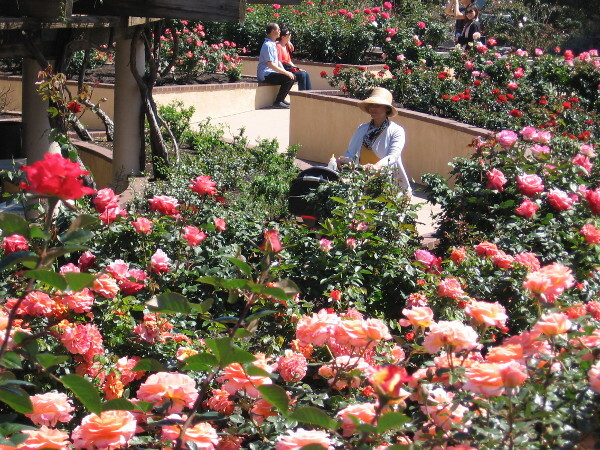 Thousands of beautiful spring roses are in bloom. 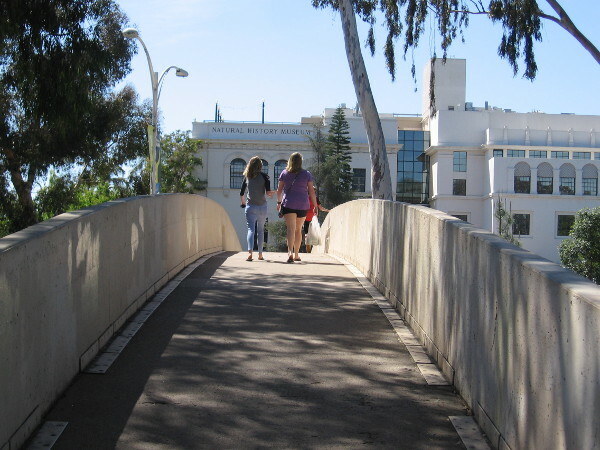 Walking over the Park Boulevard pedestrian bridge from the rose and desert gardens, back toward the San Diego Natural History Museum and Plaza de Balboa. 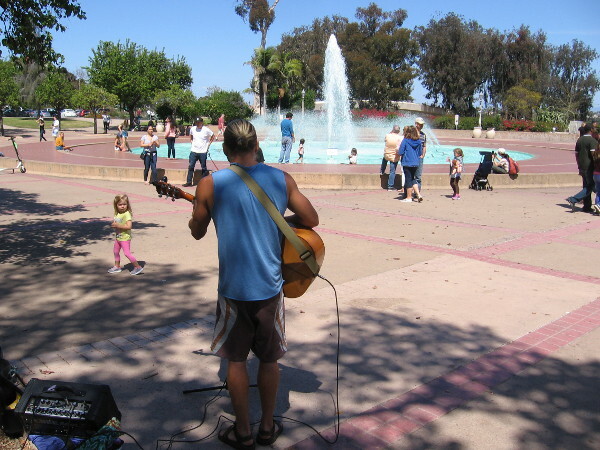 A guitarist plays in some shade near the Bea Evenson Fountain in the Plaza de Balboa. 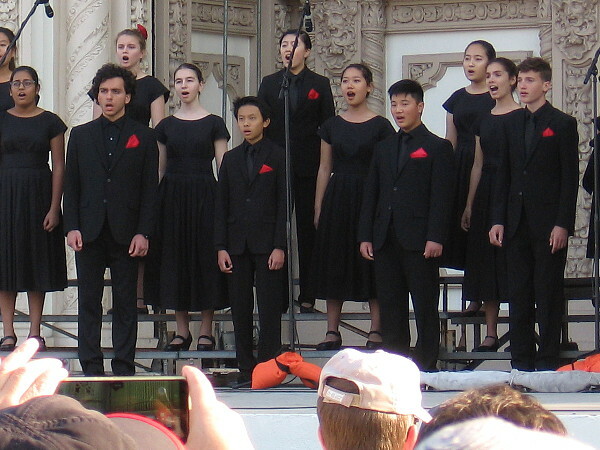 Posted on April 8, 2018 April 11, 2018 Tags balboa park, beautiful, family, flowers, photography, roses, san diego, spanish village, spreckels organ, spring, street performers, sunday, sunshine, walkingLeave a comment on Another glorious spring Sunday in Balboa Park! 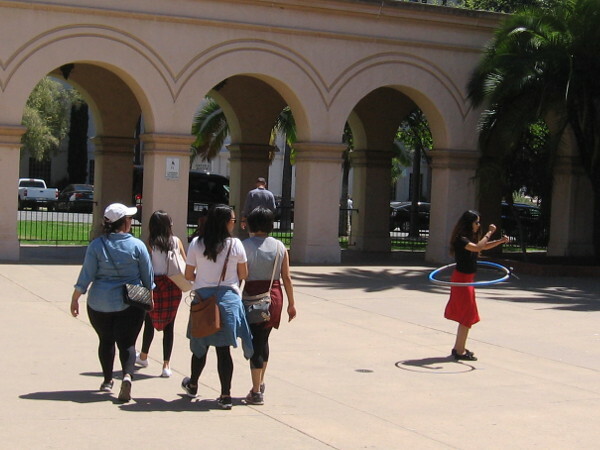 Culture, sunshine and life in Balboa Park. 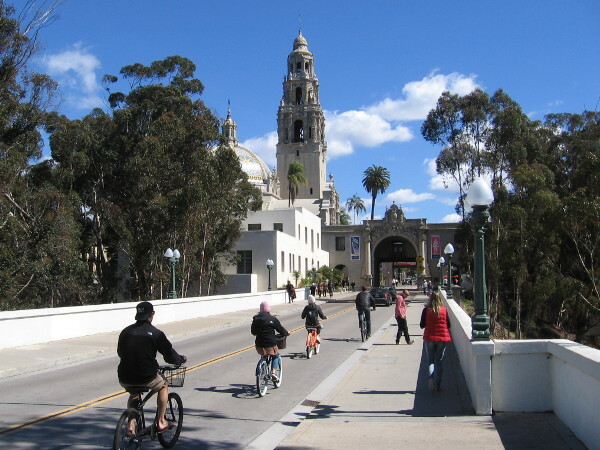 Riding bicycles over the Cabrillo Bridge into the heart of Balboa Park. 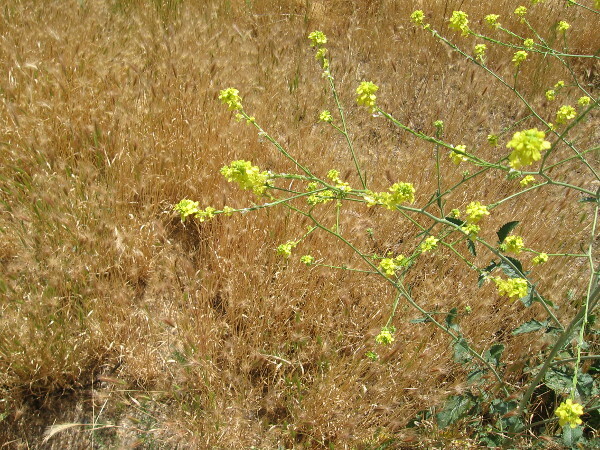 Here are some photographs from my Sunday walk through Balboa Park. I enjoyed plenty of culture, sunshine and life. That’s why I go there so often. 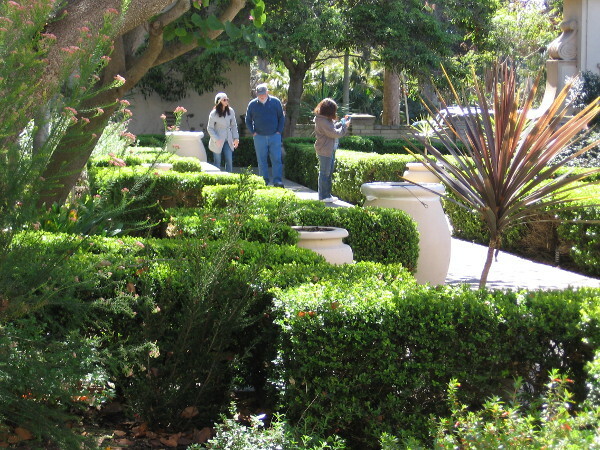 Visitors enjoy the quiet, sunlit beauty of the Alcazar Garden. Rise Up For the Arts and Culture. Preserve Penny For the Arts. 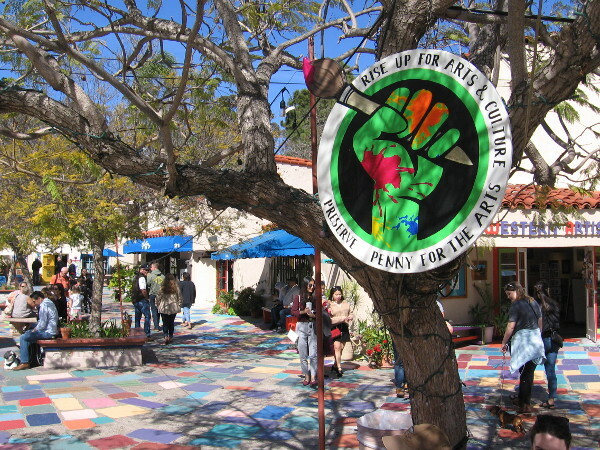 A sign in Spanish Village, where the Balboa Park Cultural Partnership and San Diego Regional Arts and Culture Coalition recently held an event. Lots of fun balloons on El Prado on another perfect Sunday afternoon. 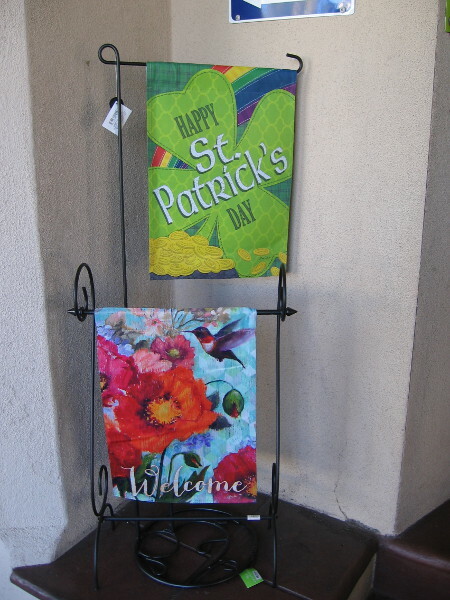 A green banner near the entrance to the Balboa Park Visitors Center anticipates St. Patrick’s Day. A banner with bright flowers and a hummingbird anticipates the arrival of spring. 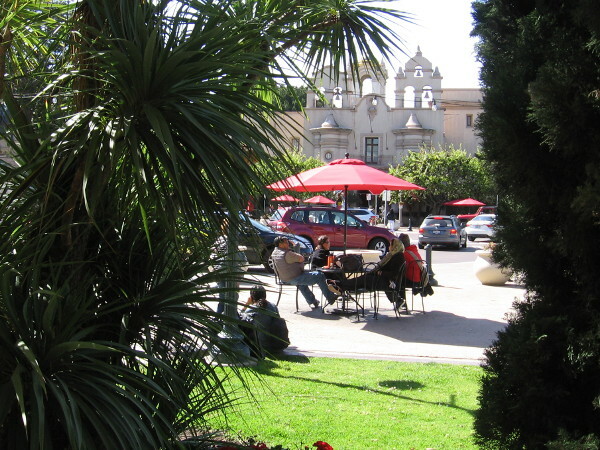 People relax at a table under a red umbrella in the Plaza de Panama. 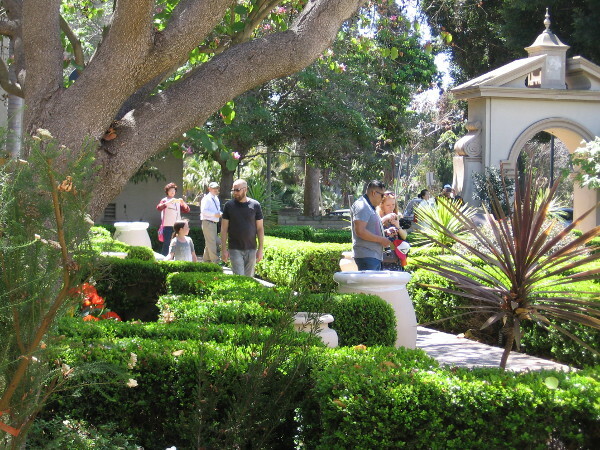 The House of Charm, home of the Mingei Museum, rises in the background. 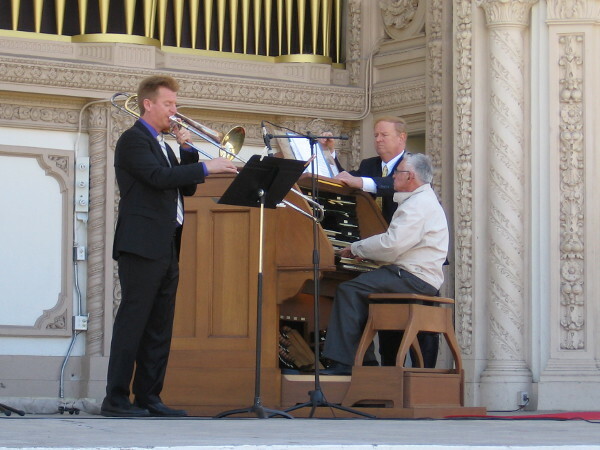 Trombonist Eric Starr joins Robert Plimpton on the stage of the Spreckels Organ Pavilion. They are practicing before the Sunday afternoon concert. 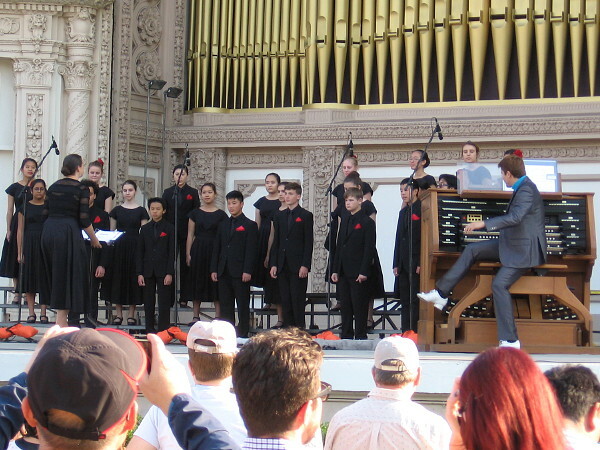 The free concert begins. Sweet music fills the park. 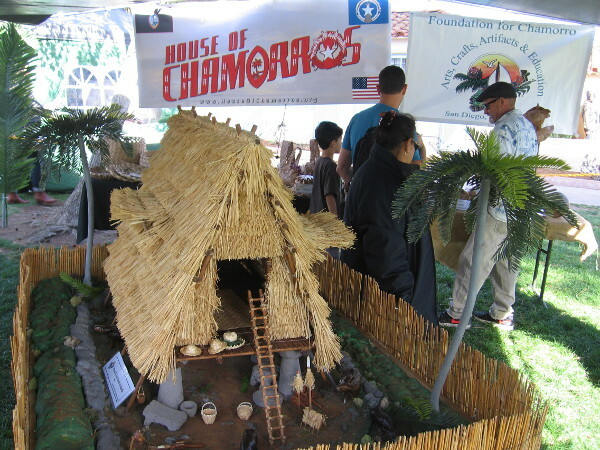 The House of Chamorros hosted this Sunday’s International Cottages lawn program. 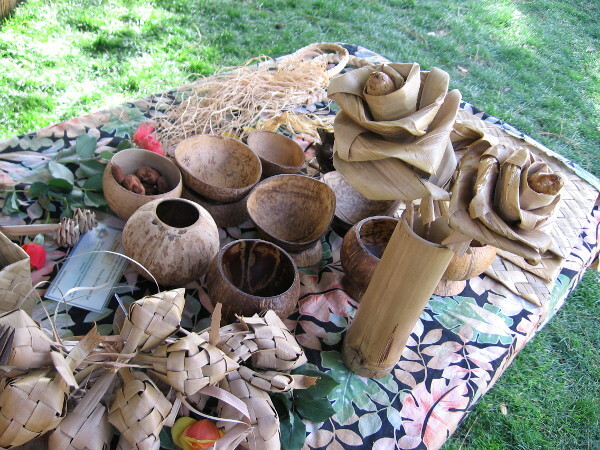 Many wonderful Chamorro arts and crafts were displayed at the event. 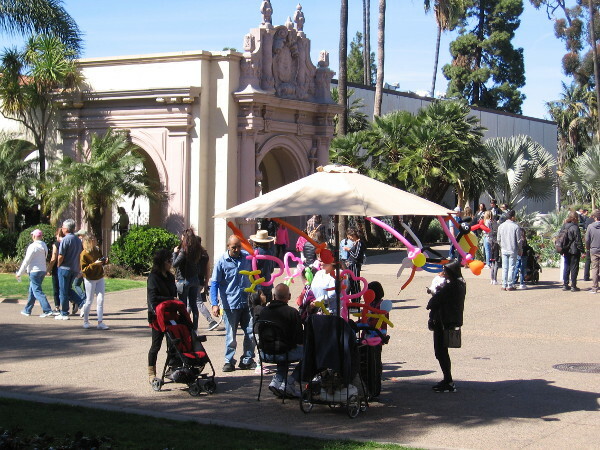 People converge in Balboa Park to celebrate culture, sunshine and life. 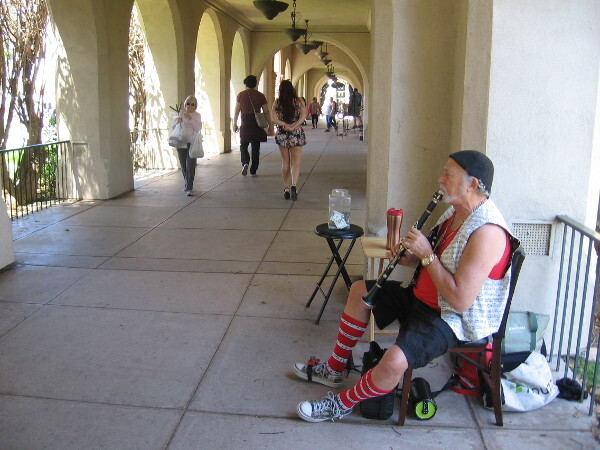 Posted on March 5, 2018 Tags art, balboa park, culture, el prado, international cottages, life, music, photography, san diego, spanish village, spreckels organ, sunday, sunshine, walking5 Comments on Culture, sunshine and life in Balboa Park.